A sense of calm. A sense of place. A sense of joy. Not to mention the five senses – the smell of fresh herbs and flowers, the taste of amazing local food, the sounds of celebration and glasses clinking, the touch of two hands and the sight of a very happy newly married couple. Willows Lodge and the Herb Farm, located in Woodinville, Washington at the epicenter of the state’s wine industry, was the perfect wedding space for two foodies who appreciate the finer flavors and experiences in life. Willows Lodge wedding photography encompasses the bright colors, the fresh air, the serene gardens and every sense in full. It’s a dream come true wedding experience, and a dream come true for a wedding photographer. Located on the Sammamish River in Western Washington’s picture-perfect wine country, Willows Lodge has outstanding views of Mount Rainier and five acres of lavish grounds. 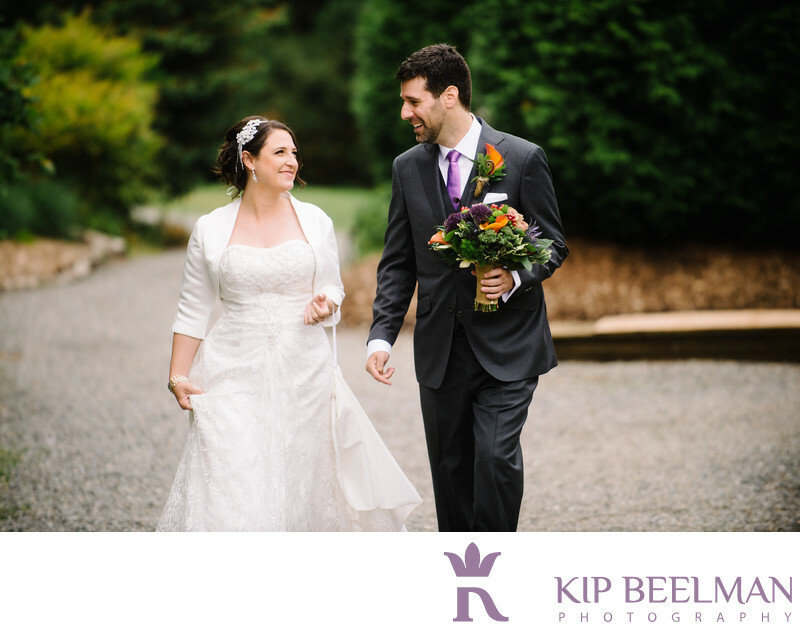 This candid image was on a portrait walk around the Herb Farm and Willows Lodge property as the celebration was just beginning; it provides a glimpse into the beauty of the location and the twinkle in the couple’s eyes. These two foodies own MELT, a mac and cheese outfit for “seekers of comfort food with a gourmet edge” that serves urban grocery stores and farmer’s markets in and around Seattle. Some hearts melted on this day and mouths definitely watered at the Herbfarm Restaurant reception, which celebrates the exceptional foods, wines and flavors of the Pacific Northwest. The senses came alive and the couple indulged in the perfect wedding event to celebrate their passions. The wedding was flawlessly coordinated by Emily Murphy of Manette Gracie and cocktail hour and reception entertainment was provided by the swinging Falty and the Defects. The culinary extravaganza of an unforgettable sit-down 7 course meal was provided by the incomparable Herb Farm Restaurant, quite possibly one of the most extravagant and lovely places you could ever host a wedding reception. Location: 14590 NE 145th St, Woodinville, WA 98072. Keywords: Hotel Wedding (48), Outdoor Wedding (72), Willows Lodge (3), Woodinville (6).